I've had the mini-files and the drills out so next up, a squadron of Austrian Uhlans from Newline designs. These little chappies look pretty good with the primer on. The excellent detail in the casting promises a fun time painting. I'll decide on the regiment later as the only uniform difference iof the three ( prior to 1814) Austrian regiments was the colour of the Czapka. A little extra drilling to keep Wiking happy. Nice start on these figures; "Impaler Fred"! Because I get tomorrow and Friday free. Would you notice in the fog of battle? Actually no! They would come as a total surprise! Not so grey as there's been a couple of changes. Painting continues. Are these uhlans compatible with the others existing 1/72 scale Austrian cavalryman e.g. Hat's cuirassiers and chevauxlegers? 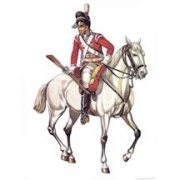 Could you post a photo of one of these uhlans riding his horse along with one of the above mentioned cavalry man by Hat in oreder to better understand their compatibility? Do you know whether Newline designs produce hussars too? These are true 20mm Gioivanni, they're smaller than 1.72 plastics. My Austrian Infantry and artillery are the same 20mm so I have no problems. I like Newline figures, but fortunately I could resist to start collecting them too. So your WIPs are always interesting for me. Swords, scabbards and carbines are done. The Lances are in position and need painting and pennants added. Then it's buttons, buckles and fasteners. The figures are now finished so they will next appear in the gallery. Are you still painting Christmas figures in red, green and yellow?